A few weeks ago we summarized features in the new edition of the Correctional Nursing: Scope and Standards of Practice (ANA, 2013). The scope and standards are described first, as the foundation for professional nursing practice regulation because they define the specialty for nurses as well as the public. The are broad statements about the practice of the profession that transcend geographic location, type of employer and population served. The nurse practice act in the jurisdiction where the nurse is licensed provides the second level of specificity and guidance related to practice. The employer, organization or institution provides the third level of specificity by establishing policies, procedures and a work environment that supports professional nursing practice. The final level in the regulation of professional nursing practice is the individual nurse who is responsible and accountable for their competence and nursing decisions (White & O’Sullivan, 2012). This description is depicted in the diagram on the left of this post. Nurses are as proficient in communication as they are in clinical care. Examples of practices that improve nurses’ communication skills include nursing grand rounds, assistance to publish articles and present at conferences. Nurses are relentless in pursuit of true collaboration. Examples of practices that improve nurses’ skills in collaboration include the development of nurse to nurse collaboration such as rapid response teams, development of clinical practice protocols, and participation in CQI activities. Nurses make policy, direct and evaluate clinical care, and lead organizations. Examples of practices that support nurses’ participation in the development of policy and other aspects of organizational leadership include membership on interdisciplinary committees such as Pharmacy and Therapeutics (P&T), Continuous Quality improvement (CQI), Ethics and Infection Control and other committees responsible for guidance regarding clinical patients care. Staffing effectively matches patient needs and nurse competencies. An example of this are systems that acknowledge nurses for clinical expertise in direct patient care by rewarding advancement in clinical education and certification. Nurses are recognized and recognize others for the value they bring to the organization. Examples of practices that support meaningful recognition include clinical ladders, identification of expert nurses and publication of nurse’s advancement clinically. Nurse leaders authentically live and engage others in the achievement of a healthy work environment. Examples of practices that support authentic leadership include participation in key decision making forums, access to essential information and the authority to make necessary decisions regarding the professional nursing workforce (AACN, 2005; Vollers, et.al. 2009). One of the distinguishing features of correctional nursing and indeed one of the challenges in the practice of correctional nurses is that prisons, jails and other correctional facilities do not have a health care mission but instead a mission of safety and security. A major role for correctional nurses is to negotiate with the correctional environment to support appropriate patient care delivered in ways that are consistent with the standards for professional practice. In order to support professional practice nurses must be knowledgeable of the state or licensing jurisdiction’s nurse practice act as well as the characteristics of work environments that are linked to quality patient care and patient safety such as the AACN described here. What successes have you experienced supporting professional nursing practice while negotiating the differences in the mission of the criminal justice system and the delivery of health care? Please share your experiences by writing in the comments section of this post. For more on the topic of environments that support professional nursing practice in the correctional setting see Chapters 4, 17 & 19 of the Essentials of Correctional Nursing. The text can be ordered directly from the publisher. If you use Promo Code AF1209 the price is discounted by $15 and shipping is free. White, K., O’Sullivan, A. (2012). The Essential Guide to Nursing Practice: Applying ANAs Scope and Standards in Practice and Education. American Nurses Association. Silver Springs, MD. 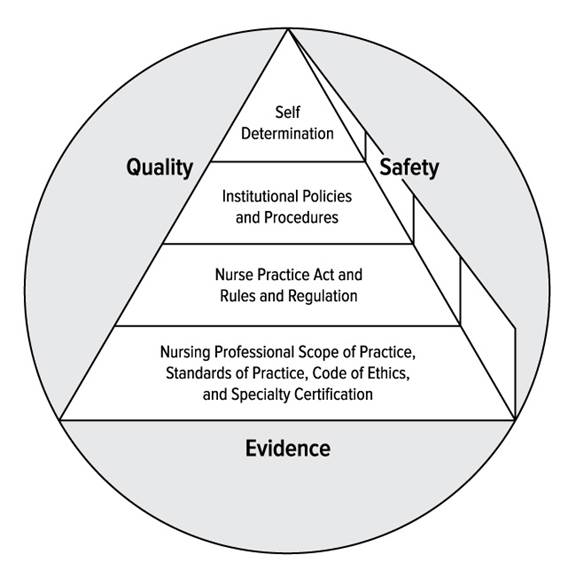 This entry was posted in Patient Safety, Professional Practice, Scope and Standards of Practice and tagged American Nurses Association, ANA, Catherine Knox, correctional nursing, Essentials of Correctional Nursing, Evidence-Based Nursing Practice, Healthy Workplace, jail nurse, Patient safety, prison nurse, Scope of practice, Standards of Practice. Bookmark the permalink. ← What is Gender Responsive and Trauma- Informed Care in Nursing Practice? Hello– When I look at this pyramid in the article about a Healthy Workplace, I am amazed at the wealth of information in that circle and pyramid. It tells the story about the profession with few words. Between the person and the parameters of regulations and guides, are the policies and standards. You can find where your own and your workplace strengths are and where energy and training can assist to strengthen the walls of the pyramid. in which we enjoy our work.